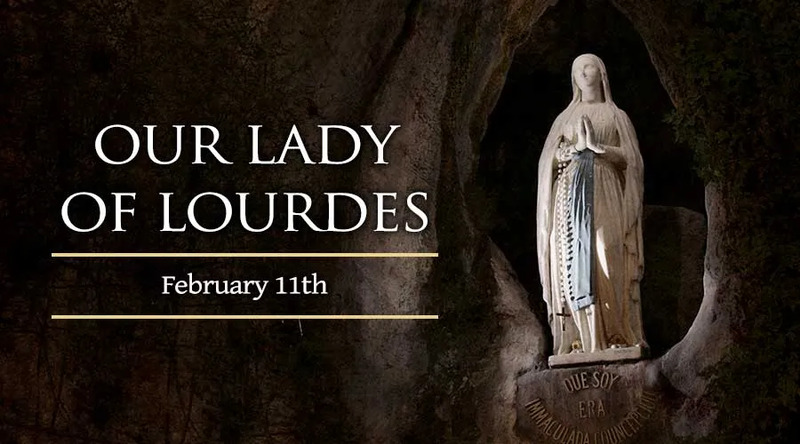 On Feb. 11, the Catholic Church celebrates the liturgical memorial of Our Lady of Lourdes, recalling a series of 18 appearances that the Blessed Virgin Mary made to a 14-year-old French peasant girl, Saint Bernadette Soubirous. The Marian apparitions began Feb. 11, 1858, ended July 16 that year and received the local bishop's approval after a four-year inquiry. Coming soon after the 1854 dogmatic definition of her Immaculate Conception, the Virgin Mary's appearances at Lourdes turned the town into a popular travel destination. Thousands of people say their medical conditions have been cured through pilgrimage, prayer and the water flowing from a spring to which Bernadette was directed by the Blessed Virgin. Experts have verified 67 cases of miraculous healing at Lourdes since 1862. St. Bernadette also has her own liturgical memorial, which occurs Feb. 18 in France and Canada and April 16 elsewhere. Born in January 1844, the future visionary was the first child of her parents Francois and Louise, who both worked in a mill run by Francois. Their family life was loving but difficult. Many of Bernadette's siblings died in childhood, and she developed asthma. Economic hardship and an injury suffered by her father cost them the mill in 1854. Years of poverty followed, during which Bernadette often had to live apart from her parents and work rather than attending school. In January 1858 she returned to her family, whose members were living in a cramped single room. Strongly committed to her faith, Bernadette made an effort to learn the Church's teachings despite her lack of formal education. On Feb. 11, 1858, Bernadette went to gather firewood with her sister and a friend. As she approached a grotto near a river, she saw a light coming from a spot near a rosebush. The light surrounded a woman who wore a white dress and held a rosary. Seeing the lady in white make the sign of the Cross, Bernadette knelt, took out her own rosary, and began to pray. When she finished praying, the woman motioned for her to approach. But she remained still, and the vision disappeared. Her companions had seen nothing. Bernadette described the lady in white to them, demanding they tell no one. But the secret came out later that day. The next Sunday, Bernadette returned to the grotto, where she saw the woman again. The identity of the apparition, however, would remain unknown for several weeks. Some adults accompanied Bernadette on her third trip, on Feb. 18, though they did not see the vision she received. The woman in white asked the girl to return for two weeks. “She told me also,” Bernadette later wrote, “that she did not promise to make me happy in this world, but in the next.” A group of family members and others went with her to the cave the next day, but only the young peasant girl saw the woman and heard her words. A larger crowd was there on Feb. 25 – but they were shocked to see Bernadette drinking from a muddy stream and eating weeds. The apparition had told her to drink the water, and the weed-eating was a penitential act. Onlookers, meanwhile, saw only the girl’s unusual behavior, and popular fascination turned to ridicule and suspicion. While others were quick to conclude that Bernadette was seeing the Virgin Mary, the visionary herself did not claim to know the woman’s identity. As she conveyed the repeated message to Fr. Peyramale, the priest grew frustrated and told Bernadette to ask the woman her name. But when she did so, the woman smiled and remained silent. Her identity remained a mystery after the initial two-week period. Three weeks later, on the Feast of the Annunciation, Bernadette visited the cave again. When she saw the lady, she kept asking to know her identity. Finally, the woman folded her hands, looked up and said: “I am the Immaculate Conception.” The seer, devout but uneducated, did not know what these words meant. She related them to Fr. Peyramale, who was stunned and informed his bishop. Bernadette saw the Blessed Virgin Mary two more times in 1858: on the Wednesday after Easter, and on the feast of Our Lady of Mount Carmel. In 1862, the local bishop declared the apparitions worthy of belief. St. Bernadette left Lourdes in 1866 to join a religious order in central France, where she died after several years of illness in 1879. By the time of her death, a basilica had been built and consecrated at the apparition site, under the leadership of Fr. Peyramale.